Kenneth Toleman was born in 1892 at Mortlake to Jessie Agnes Toleman, a daughter of the late William Toleman and Sarah McKenzie. Another brother William Frederick was born in 1896 in Prahran and Ernest in 1897 at Footscray. In 1906, Jessie Toleman married Henry Williams and went to live in Hopetoun. However, it seems Kenneth was raised by his grandmother Sarah Toleman and remained in Mortlake. When Kenneth left school, he became an electrician and was a member of the Mortlake Fire Brigade. Kenneth worked with the Electric Light Company installing overhead wires at Mortlake and later at Koroit and Nirranda. Around 1914, Kenneth moved to Hamilton to work for the Hamilton Electric Light Company. He boarded with Mrs Hunter in Gray Street and joined the Hamilton Fire Brigade and Hamilton Rifle Club. On 15 January 1915, Kenneth enlisted at Hamilton and he went into camp with the 14th Battalion. A send-off was held for Kenneth at the Mortlake Methodist Church Sunday school on 26 April 1915. Kenneth Toleman left Australia on 17 June 1915 and by his side was fellow Hamilton electrician and mate, Englishman Reg Briant. 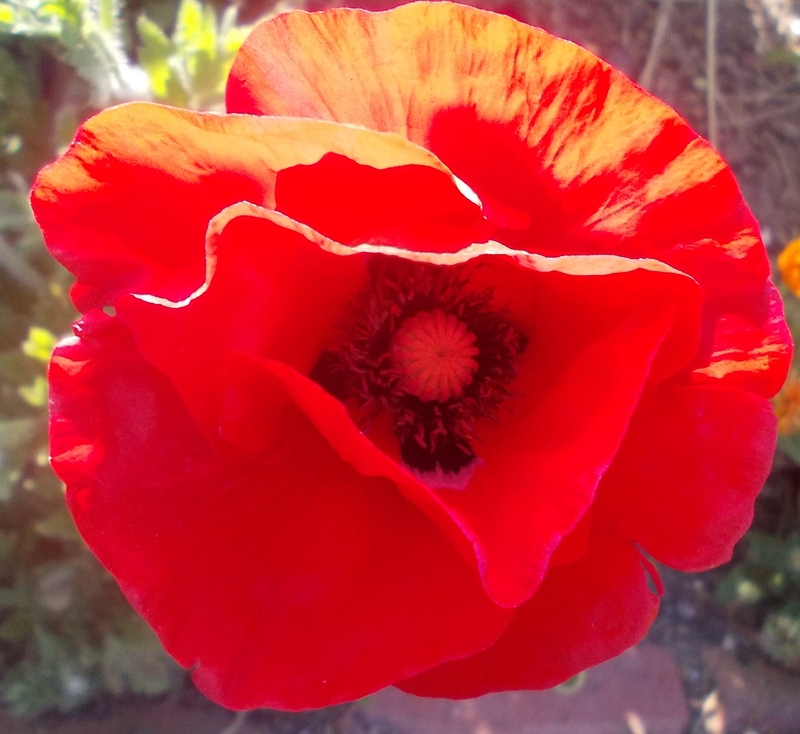 Kenneth and Reg arrived at Gallipoli on 1 August 1915. It was a bad time to arrive with heavy fighting and great loss of life throughout the month. The day of 22 August was a particularly dark day. The battalion took part in the attack on Hill 60 and Kenneth lost his mate, Reg Briant. Reg was reported missing after the attack but it was another year before an inquiry found he was killed on that day. Since Kenneth was there, he would have known there was no hope. On 5 October 1915, Kenneth left for hospital at Mudros with dysentery. He took the opportunity to write home on 12 October and put out a plea for Mortlake men to enlist to help those left at Gallipoli. “WANTED!” Mortlake Dispatch (Vic. : 1914 – 1918) 1 December 1915: 2. Web. 12 Apr 2017 <http://nla.gov.au/nla.news-article130001237&gt;. On another occasion, Kenneth wrote to his grandmother Sarah to tell her of his encounters with Turkish soldiers. 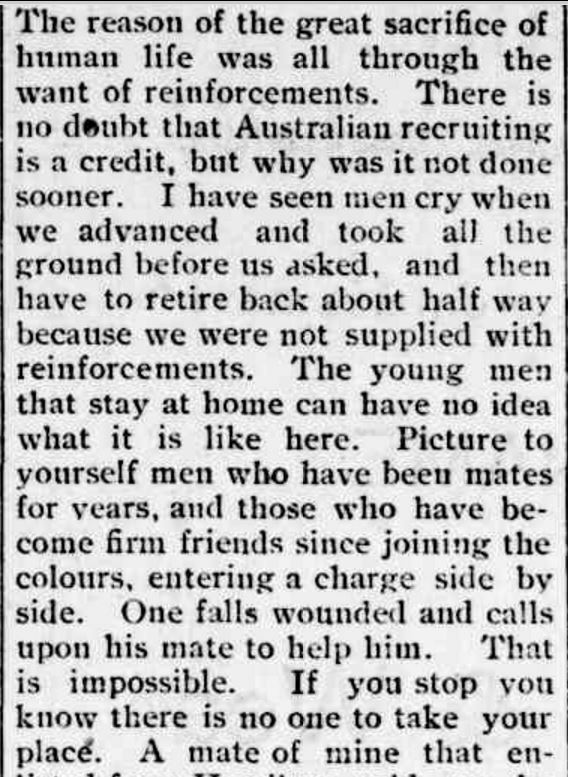 He praised the way they fought and their fairness, knowing of Australian soldiers who’d had their wounds dressed by the Turks and another wounded man who was given half the rations of a Turkish soldier and sent on his way back to the safety of the allied lines. Kenneth rejoined the 14th Battalion at Gallipoli on 17 November 1915. After their evacuation, Christmas 1915 was spent at Mudros East on Lemnos. Although slightly delayed, Kenneth eventually received thirty-five letters and three parcels. One of the parcels was cakes and sweets from Mrs King in Hamilton and a letter came from Captain White of the Hamilton Fire Brigade with Season Greetings. 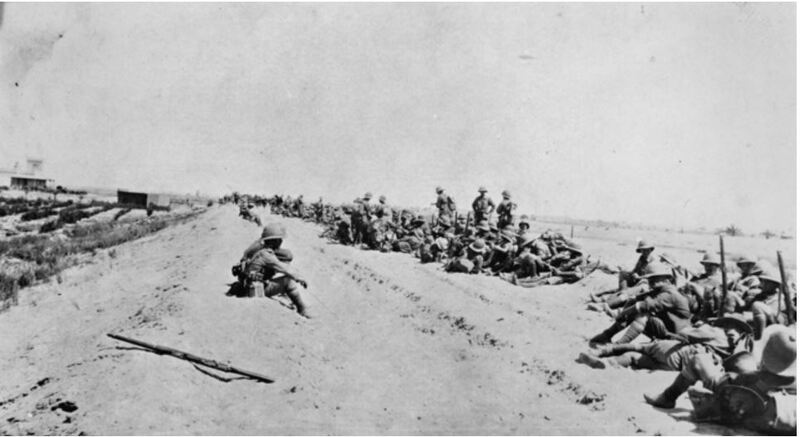 By 1 January 1916, the battalion was back at Alexandria. On 9 February 1916, Kenneth wrote to Sarah, apologising for not having written earlier but he told of orders of no letter writing until three weeks beyond their evacuation from the Gallipoli. He told her it took all of his and the other men’s manhood not to cry at the thought of what the Australians had been through. Of course, Kenneth had personal grief with the loss of Reg. He later had a letter from Reg’s former schoolmaster in England, inviting Kenneth to visit if he got to England and he was welcome to stay as long as he liked. A promotion to corporal came on 28 February 1916 and on 3 March 1916, 146 men from the 14th Battalion transferred to the newly formed 46th Battalion at Tel El Kabir. Kenneth was among them. Soon after he received a promotion to Sergeant. During May 1916, Kenneth was in the trenches at Serapeum, Egypt and the weather was very hot. On the evening of 13 May, Kenneth sat on the top of a trench in the cool air after an exceptionally hot day and wrote to Sarah. He told her they were paid that day and were able to buy items from the stores such as tinned fruit, jam and pickles. In shorter supply was tobacco. They were normally paid as close as possible to the 15th and 30th of each month. Kenneth enclosed a Christmas Card from General Birdwood to the troops. Kenneth arrived in France on 8 June 1916 and within three weeks was granted leave to England for eight days. He took the opportunity to meet with Reg Briant’s sister Dorothy. He also accepted the invitation of Reg’s schoolmaster and paid a visit to the school at Lymington, Hampshire. He was taken on a tour and was the first Australian soldier the children had seen. He was given three cheers in all the classrooms. When he next wrote home to Sarah, he described it as a holiday he would never forget. At home, Sarah was reassured by a letter from Dorothy Briant who said Kenneth was “well and strong”. 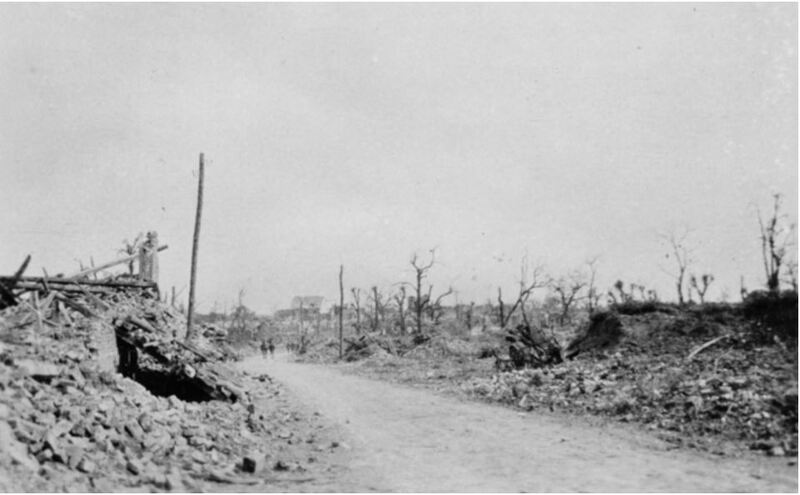 On 2 July, the 46th Battalion marched into Sailly in northern France then moved into trenches under two kilometres from Fleurbaix on 5 July. The following day was quiet, but out of the heavy mist on the morning of 7 July, came the sound of machine gun fire growing in intensity. Soon two men were wounded. Kenneth and Sergeant Norman Max Pontin of Richmond carried one of the men from No Man’s Land around seventy metres through heavy machine gun fire before safely reaching the parapet of their trench. Their gallant actions were mentioned in divisional orders and they received the congratulations of division General Officer Commanding. As a result, Kenneth was promoted to 2nd Lieutenant on 2 August 1916. 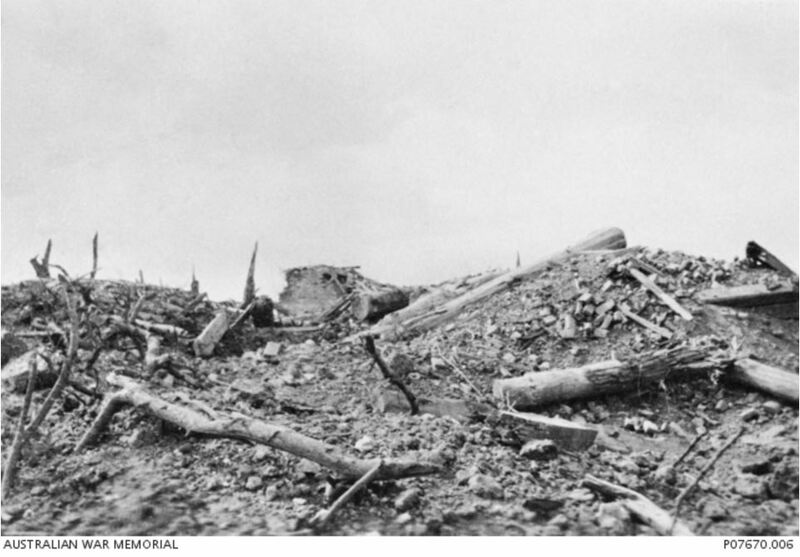 The battalion continued on to Pozieres and at times Kenneth acted as temporary Captain. Thanks to the photos found in the personal effects of Sergeant Norman Pontin, there is a record of some of the scenes the men of the 46th Battalion saw there. On 1 October 1916, the battalion was at La Clytte, Belgium and moved into the frontline the following day to relieve the 48th Battalion. Ten days later they were still on the frontline. On 12 October 1916, Kenneth received a wound to his abdomen and died soon after at the 10th Casualty Clearing Station. There was sadness among the men of the 46th Battalion as Kenneth was considered the most popular officer in the battalion. On 25 October 1916, news Kenneth was dangerously ill from his wounds of 12 October reached Mortlake via the Mortlake Dispatch. The following day the news had reached Hamilton. Three days later, the Dispatch reported on Kenneth’s death stating no sooner had the ink dried on the last edition, the sad news came through. At the time, the past three Mortlake men killed were fire brigade members and the past three wounded also members. On Sunday 29 October 1916, a memorial service was held at the Mortlake Methodist Church for Kenneth. 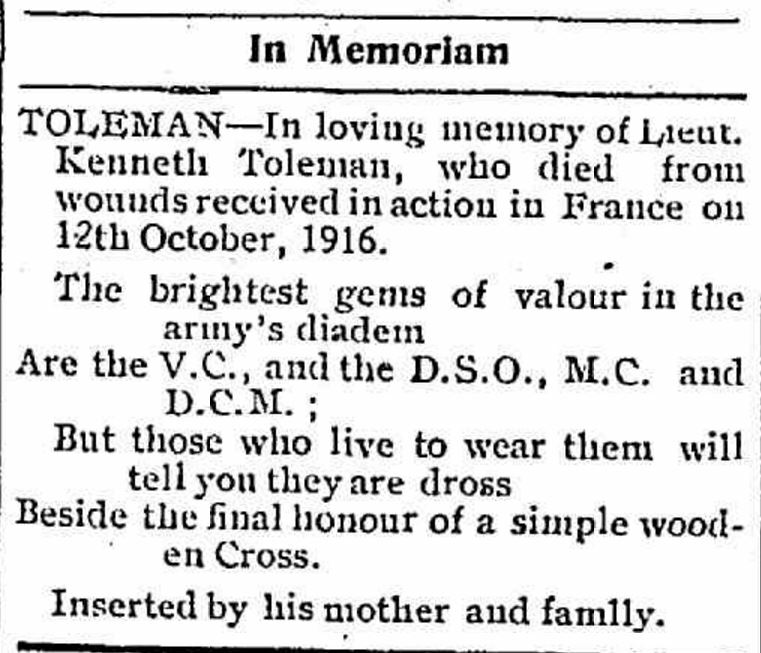 Two years after Kenneth’s death, Sarah Toleman placed a notice in the Mortlake Dispatch for the grandson she raised as her own son. “Family Notices” Mortlake Dispatch (Vic. : 1914 – 1918) 12 October 1918: 2. <http://nla.gov.au/nla.news-article131449597&gt;. Sarah Toleman died in 1926 aged seventy-nine. Kenneth’s birth mother Jessie died in 1946 at Fitzroy aged sixty-nine.